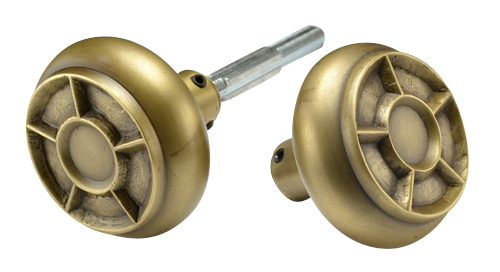 Solid Brass Pinwheel Inlay Spare Door Knob Set (Antique Brass Finish). Each knob measures 2 2/9 inch in diamater with an approximate 2 inch projection. Each set is constructed from solid brass and hand finished. Available in several finishes including polished brass, antique brass(shown), oil rubbed bronze, polished nickel, polished chrome, brushed nickel, and flat black.